The Splat mug by Caroline Bessey features an explosion of watercolour splashes in a rainbow of colours! 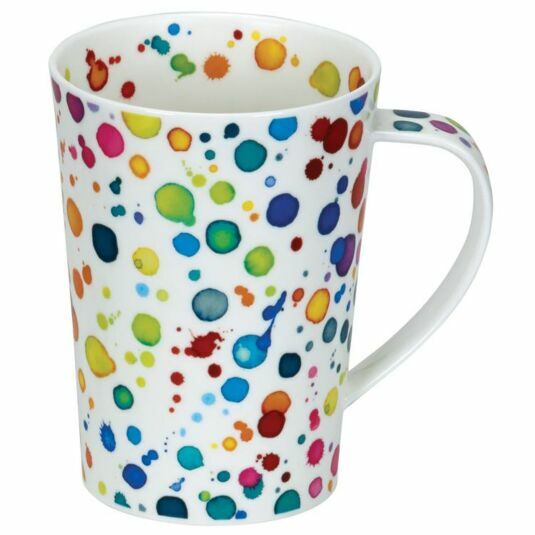 With painted dots splatted around in a myriad of sizes and colours, this delightfully messy design will brighten up your day whenever you enjoy your favourite brew. A straight-sided mug with a big capacity – half a litre - that’s almost a pint of tea, coffee or hot chocolate! The clean lines and generous handle make it easy to pick up and the straight shape is perfect for displaying the many different decorations designed by the Dunoon artists. Despite its height, Argyll is still dishwasher and microwave safe, with the exception of those designs featuring gold embellishment.